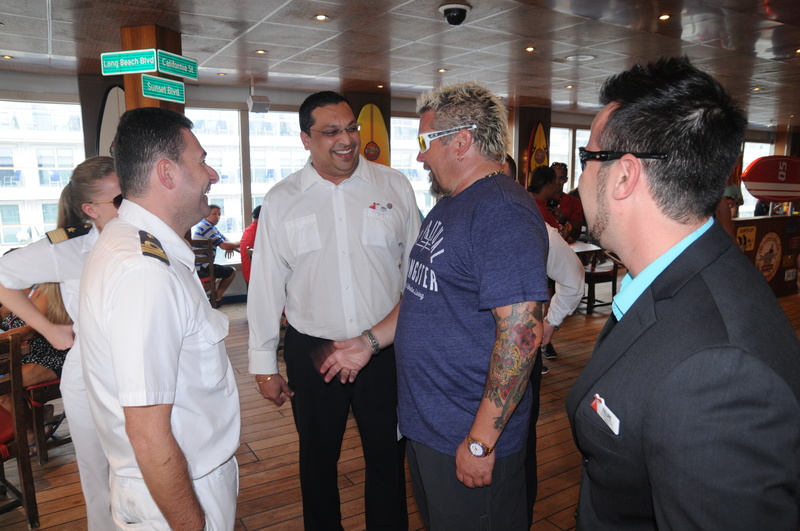 The Carnival Liberty welcomed a special guest over the weekend — Food Network star Guy Fieri who was on board to check out his namesake eatery, Guy’s Burger Joint, while the ship was docked in St. Maarten. The spiky-haired chef, author and restaurateur went behind the counter to chat with Guy’s Burger Joint staff who serve upwards of 1,000 of the delicious hand-crafted burgers per day – all free of charge. Carnival Liberty was the first Carnival ship to feature Guy’s Burger Joint whose menu was developed in tandem with Fieri and offers several variations of freshly grilled burgers, hand-cut fries and an elaborate toppings bar. Since the first Guy’s Burger Joint debuted in 2011, the popular poolside eatery has been added to seven additional Carnival ships. A Guy’s Burger Joint will also be featured on the new Carnival Vista which is set to debut in May 2016.